As we all know, central to the recent flooding is the failure of the Foss barrier. After I wrote yesterday’s page (intended as one of several on the subject), this morning brought an announcement from the government that extra funding would be made available including £10m reserved to improve the Foss Barrier. 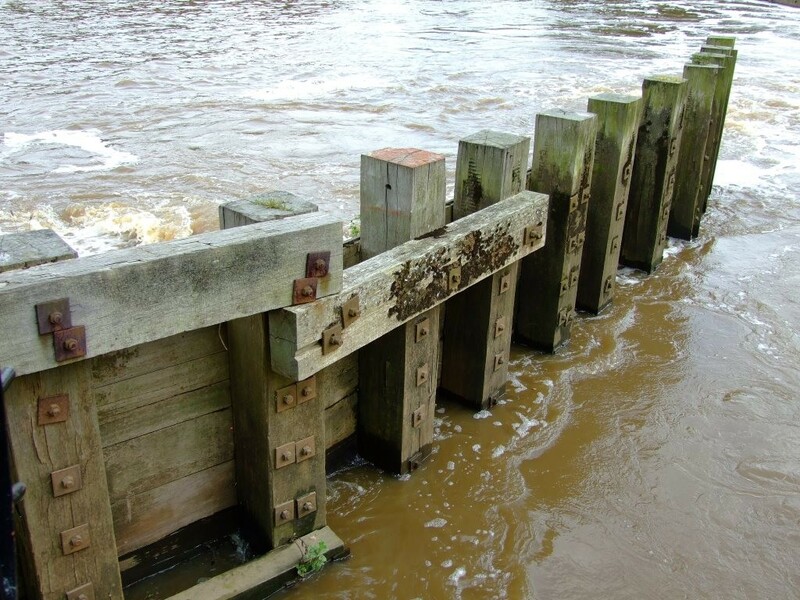 Proposed spending includes an estimated £2 million on an upgrade of the Foss Barrier and pumping station, which protects thousands of properties alongside the River Foss by preventing floodwaters from backing up the river from the Ouse. Another £3.5 million is needed for an appraisal and replacement of the Burdyke and Holgate pumping station, £1.5 million for the restoration of the Clifton Ings barrier bank and £5 million on developing and delivering a range of measures to reduce the impact of flooding in unprotected areas of York. So now, after the dirty deluge has caused so much distress to so many people, some funding is promised. A bit late perhaps, for those whose homes and businesses flooded? And after all the speculation, the promise of funding would seem to confirm the widely-held suspicion that a lack of funding caused the problems with the Foss barrier? Investigations and reports into the recent floods are promised by the relevant authorities. There have been many reports since the 2000 floods. Have they made any difference? I’ve read a lot of online comments in recent days, and there seems to be a desire to find someone or something to blame. I don’t think any of us would like to be in the position of having to decide whether to leave an apparently unreliably-pumped flood barrier open or closed, which seems to have been a case of having to decide on the least worst option. I’ve seen suggestions that somehow the homes and businesses around the Foss were ‘sacrificed’ to protect the Ouse-side properties. And also some rather hard-to-fathom theories and speculations. So perhaps today’s announcement of funding is an admission that the city’s flood-defending infrastructure has got a bit old and knackered and needs some maintenance. This increased rainfall, and increase in rainfall rushing through York’s rivers, seems to be the ‘new normal’ we’ll have to learn to accept. I’m sure many of us have been reading comments and articles not only about the York floods and the Foss barrier but about the wider issues. With some saying dredging is the answer, and others saying that’s not the case, and others focusing on the way the farmland above us is managed. Comments welcome, as always. More to follow, as I wade through a flood of recently-read reports. Hi Lisa – great perspective as always. I have also seen many comments and heard from victims & others on the flooding – but draw a rather different conclusion. I get the sense that people want to know what happened – step by step. An honest, open truthful timeline. I didn’t get the sense, unlike you, that people want to blame any one person, although, clearly, political operatives are just waiting to pounce on ‘govt cuts’ (rightly or wrongly at this point). But I, and they do want to know, and are entitled to know, the events that lead to the multiple infrastructure fails that made a bad situation so much worse. By seeming to characterise citizens who want to know the truth as wanting to blame ‘someone’ is unfair as I see it. At least as a first position they simply want to know the truth, now, not in months or years as is the usual form. I am also, as an aside, quite astonished that media have hardly mentioned the second huge infrastructure fail- the BT fails. With both failures having several things in common both power related it seems- one is location of power source & the other being the back up generators- where were they? Why didn’t they work? Lots of questions, let’s hope we get answers soon. But one answer is cristal clear, the Foss properties were sacrificed as has been made quite clear to all. All the more reason to get the answers soon, as clearly Foss properties would be sacrificed again, in similar circumstances. The metrics will already be codified as well the timeline. This should be published this week, with more detail later. Victims and non victims alike deserve nothing less than an immediate outline of what happened, with assurances as to what is in place to mitigate against a similar occurrence. Thanks for adding your thoughts and perspectives Gwen. I know you’ve been closer to the affected areas and that you’ll have spoken with people directly affected. Since you added this a few days back more information has come out, of course, in a recent piece in the Press, about the circumstances around the decision to raise the Foss barrier. You raise the issue of the BT failure, due to the flooding of the exchange at Stonebow. It did seem odd that a building which was built so close to the Foss, in the 1950s (ie before the Foss barrier) didn’t seem to have adequate flood protection measures? Investigations and reports are promised. Perhaps they’ll make things clearer. Now that the Foss/Ouse spate of flooding is diminishing it is time to get real about building on traditional flood flats in York.I have deep sympathy for all business and private people so badly hit,over Xmas,but most empathy for those who bought houses/flats n the Denison St/Huntington Rd area costing around £200k,which as photos show, suffered badly .It is an area I once knew well as a young lad living at no 23-old terraced house right next to high wall separating us from the river Foss.For around two years,I played in the back alleys,attended St Thomas’ school Lowther St,in preparation for Nunthorpe School,and Hop Scotched my way along the flagged path on Huntington Rd to the sweet shop opposite Park Grove.It was always cold and damp in Winter,and hot and damp in summer,constant reminder of the Foss next door.Eventually came to be bull dozed,and replaced with modern flats and houses.I am wondering now how many of those involved in the financing/planning and purchasing of these dwellings,were aware of the dependance,on a few pumps,at the confluence of Ouse/Foss,for the comfort and cost effective ness of their investments.Seems to be awfully quiet in this responsibility area,and what effect has this Xmas calamity had on the value of these “Flood Plain”Properties,and well advertised views on York as a popular place to live? I believe there will be many people in Old York asking the same questions! There are indeed many people asking the same questions, and many others. I’ve been for a walk by the Ouse today, still very high and well beyond its usual banks. But I’ve seen that so many times, so used to it. Does seem that the Foss barrier, in working so effectively for so long, has resulted in a forgetting of the flood threat from the Foss and the damage it can do. I’ve been trying to clarify how many of the properties built in the last decade or so by the Foss have been built with flood protection measures in mind (eg not having residential accommodation on the ground floor, having a raised level ground floor, etc). Many people Foss-side seem to have been told/believe that ‘the Foss never Floods’, because of the Foss barrier. If buildings have got through the planning process based on that, or an out of date idea of flood risk, then that is really troubling. With the older buildings we can’t do much about it, but I hope the newer ones are all as ‘flood proof’ as they can be. Regarding the properties that I am aware of… The new ones tucked behind Huntingdon Road, Dennison St and Gladstone St.. They were built so I think most if not all had only their garages flooded but not in the main the houses ( some were flooded note) I stand to be corrected on the ones well back on Gladstone Street. But the old Victorian homes all caught it I’m afraid. In fact walking along Huntingdon Road leaving the city, few on the Foss side escaped. But shockingly to me, a significant number of those houses on the higher side of Huntingdon Road (left as we go out of the city) were flooded at least to basement level. Yearsley Crescent, which I had to admit I had never been to, suffered badly. I didn’t go past there but assume as Huntingdon Road shadows the Foss for a ways, it will be similar. Clearly we have to use this as a lesson, building on flood plains is nuts, builders make a profit and the community will have to pay time and time again as we have to replace infrastructure which can only partially be flood protected.